You can always create a new thread to discuss the BMS system, if you wish. Regarding a Battery disconnect, I would use the battery disconnect as a "last resort". 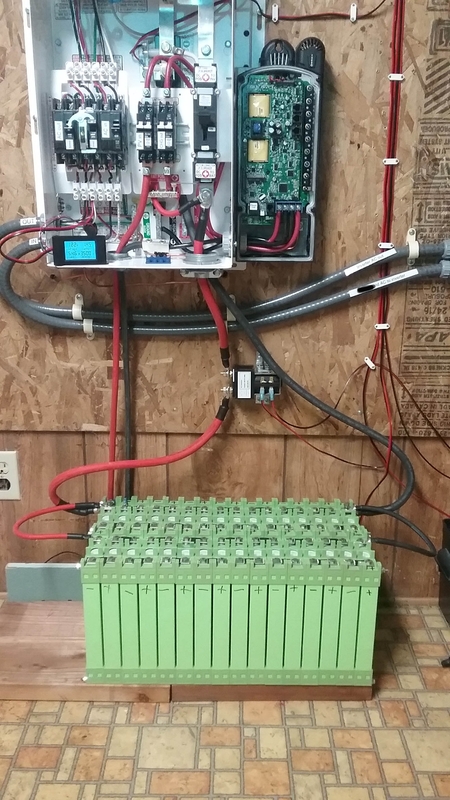 Most DC power systems really use the battery bank to manage the DC Bus Voltage. If a contactor (or fuse, breaker, switch) disconnect the batter bank under load/under charge--There is a chance that a voltage spike will take out some other attached devices (i.e., the solar charge controller cannot shut down quick enough to avoid 2x or higher bus voltage, or inductive surge). Having alarms, remote shutdowns for inverters/loads (and charge controller, AC battery chargers, wind/water turbines, if possible) set to trip before the battery contactor would be my suggestion. For example, pulling the battery cable off a car battery can wipe out significant amounts of devices (engine computer unit, radio, dashboard displays, etc.). 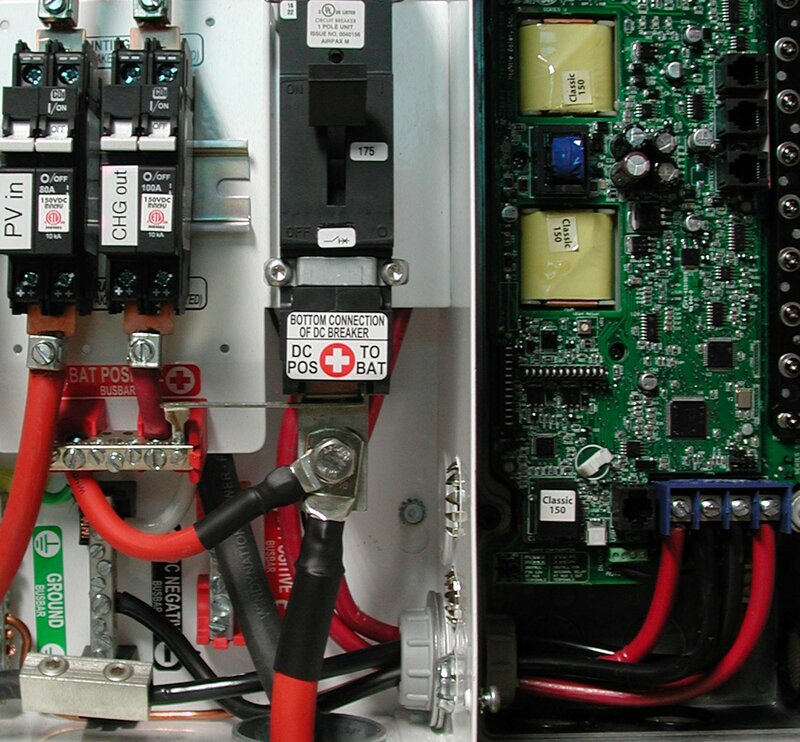 The alternator control is way to slow to manage a stable DC Bus voltage if there is no battery connected. Typically, battery disconnects are used as a last ditch to prevent/help extinguish fires (overheated cables, shorted components). If you have a "live" battery disconnect under charge/load, you may have some other failures that need to be addressed. Not saying that a contactor on your battery bank is a "bad idea"--Just using defense in depth and (I suggest) this is a last resort as a safety device. Connecting the contactor circuit to an external "panic switch" (fire fighter access) and/or fire detector (high heat, not necessarily a smoke detector which is subject to false alarms). -Bill "in my humble opinion" B. Thanks for this input Karrak. Ideally I would like to employ one mechanism to disconnect the batteries, so a cutoff that literally breaks the cable connection from the batteries seems the simplest and most assured approach. Unless you know of some compelling reason to not have solar juice entering the cc if it is powered off?? Charge controllers should always have the battery connected BEFORE the PV (or whatever source) input. If you want to disconnect the battery you really need to disconnect your incoming power first, and always reconnect the battery first, allowing the CC to reboot prior to hitting it with PV. Has anyone measured such inductive surges on their system? Does adding a surge suppressor make sense? A typical 100V, 200A mosfet is .0024 ohms. So an efficient 1W of heat when it's passing 1000W ([email protected]). Conceivably, it could be switched somewhat slowly to reduce surges. And so far the LVD on the Magnum has not triggered when the freezer comes in. Naturally this is a subjective comment as I don't know how the magnum will behave with multiple loads PLUS borderline pack voltage. It might be interesting to see if the Magnum has a cutout buffer. Same on the high side. In this case the charge controller is keeping the lid on pack voltage. It's floating the cells at around 3.3v. Does the cc need a backup? I just came across a thread on the Midnite forums where a guy had a rare failure of a Classic 150 whereby the cc allowed unregulated panel voltage to get to the pack. The battery voltage was raised sky high to the panel voltage and the Calb cells were bulging when he discovered the fault. If a HVD had been set at, what, 3.65-3.7v per cell, perhaps such a disaster would have been avoided. The Magnum has a remote on-off, correct? Why not just use that to shut down the inverter in case of undervoltage? And for overvoltage - I think a relay that disconnects the solar _input_ is the way to go there. Lower current. Inductive kicks are probably rare for these systems--Unless you have a good sized "brushed" or universal motor attached and under load. The bigger issue, in my humble opinion, is with charge controllers and such--The battery bank is what has the ability to hold the bus voltage in nominal voltage range. Charge controllers just do not (usually) have the ability to regulate their output that fast (to cover a battery disconnect). As best I understand it the Magnum does have a "remote" on/off, but in the form of a wired remote unit (which I have) that manually turns it off. But as stated up front, the Magnum has a built-in, settable, LVD. I am simply looking to augment that with a redundant LVD cutoff..... given the sizable investment in LFP batteries. I'm trying to keep "Murphy" at bay if possible. And given the last few additional comments the complexion of the proposed solution of a backup cutoff to save the batteries has evolved from a one device solution (a contactor on one battery cable) to a two device solution, given that several of you are noting that the solar input on the cc should be broken rather than the battery input side. LostinSpace said:relay that disconnects the solar _input_ is the way to go there. Lower current. Right; that's what I am saying. Rely on the LVD normally. If/when the LVD fails, use the remote on/off to shut down the system and protect the battery. That way you don't need the high power/high current relay that exposes you to the risk of overvoltage. 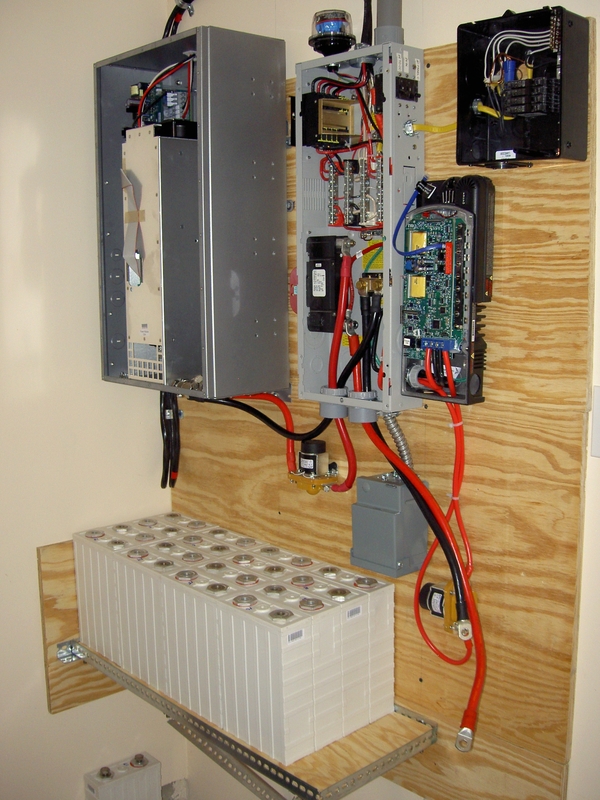 bill von novak said: If/when the LVD fails, use the remote on/off to shut down the system and protect the battery. I think you're implying human intervention though. LOL. I want a setup so that if I am away / asleep / or "otherwise engaged" an unattended shutdown will be performed (if the frontline LVD/HVD fails). btw - I liked your earlier idea about using a Midnite remote trippable circuit breaker. Looking into seeing if that breaker would be a drop in replacement for the 175A breaker that came with the Magnum MMP mini-panel. I just measured, marked, etched the lines, drilled holes in the corners and used a jigsaw to cut the stainless steel. The contactor I used is normally closed and since I have the battery tender connected to the grid it should hold it open as long as needed. If the grid is down, I would have about 8 hours. The second contactor is wired the same way except it opens the PV input. Yes Most MPPT controllers should disconnect from the solar array FIRST, before disconnecting from the battery. The electronics internal to the CC runs off the stable battery voltage. Applying PV array voltage to unpowered internals is generally bad and none of the Mfgs I know of prescribe doing that. No human intervention. Get the remote on/off. Replace the on/off switch with your relay. If the system goes undervoltage, then the UVLO stops the discharge. If that fails, your relay trips and shuts off the inverter. Thanx. This particular model would not work because it is a 12-24 automotive solution. My pack is 48v. However, it seems Victron came out with a solar specific version in 2016 that handles 48v packs. So in a way this is a made to order solution. At least for the battery to inverter backup disconnect. The idle current draw is extremely low, so this device could not only be a good swap out for my current normally open contactor, but may negate the need for a latching relay since the draw on the 12v battery is minimal. The battery protector looks like it let's you program some pre-determined voltages for disconnect, or, it looks like it will talk to a BMS. My BMS does not have a 'mothership' controller board (it is a distributed architecture) but if by talking to a BMS means detecting a voltage, or simply a closed circuit, the JDL 404 will likely allow for setting a specific cutoff voltage. It's a tad pricey, retailing for over $230 at a few retailers I googled. But I found it steeply discounted for $147 in the US (my location). A few of the latching relay solutions suggested by others here ring in around $200, so this baby may be worth considering. So with respect to the other comments being posted about not powering down a cc without first cutting power from the solar input... I am realizing that the way I wired my existing (normally open) contactor is not following that advice. It is interrupting one leg right off the battery, which drops power to all downstream equipment when tripped. See photo. The cc connects inside the wiring panel. So then I started wondering if you had made the same "mistake", and in looking at your photo it appears that, no, your LVD is downstream of the cc, between the cc and the inverter. Am I interpreting that photo wiring correctly? I think you're right Rick. It's gelling for me too, now that you mentioned it again. Kind of a best-of-all-worlds solution. You eliminate a component, and it's connections. And the inverter is already designed to do what one is simply going to intervene in and force. Assuming that the on/off circuitry in the inverter does not fail. Note that the 404 will not trigger a momentary connection. When the relay closes it stays closed until the state changes. I just tried pushing and holding the on/off switch on my Magnum inverter and it turned off and stayed off. It did not wait until I let up on the button. I'm assuming the switch is a normally open / push to close type. So this could work. I missed this reply earlier. Perfect. I get it now. Thanx so much. EDIT: I didn't realize that Magnum made a separate remote on/off switch. I have a remote display, that among other things, has a manual push button for turning the inverter on/off. I thought that's what you've been talking about all this time. But your last reply seemed to be referring to a dedicated remote. Sure enough, upon checking just now they do make that kind of remote to! . And only $28 bucks. What's not to love. No problem here, the Outback will take a toggle switch. Enjoy your system, looks like you put a lot of work into it. Watch out for the solid state relays--There are a lot of counterfeit product out there. If the price is "too good to be true"--It may be. Also, (it appears) that many of the counterfeit SSRs failed shorted (on). Not a good thing for your application. PS: I should also add that SSRs (in general) need to be well heat sinked. They run much hotter than a typical mechanical relay. I agree that AC Triac based SSRs are not particularly efficient but this should not be the case for MOSFET based DC SSRs. It is just a matter of using enough low On resistance high current FETs in the SSR. I specified the 200A variety as it has twice the rated current carrying capacity that is required. I would think that the inverter will only be running at full power for a very small amount of the time so average power loss from the SSR should be very low. Unfortunately, failing short circuit is the most common failure mode for any MOSFET if it is over stressed. Is the likelihood of a SSR failing any higher than a relay not functioning? For any switch that disconnects the solar panels from the battery you have to take into account damage due to lightning. This makes it much trickier. I think my favoured position at the moment would be to use a relay powered by the solar panels as a safety switch between the panels and the solar charge controller if the solar controller uses a buck mode switching circuit. If there charge controller uses a transformer coupled circuit with DC isolation between the panels and battery which should be true of the high voltage charge controllers a safety relay/SST is unnecessary if there is an external input to the charge controller to shut it down. 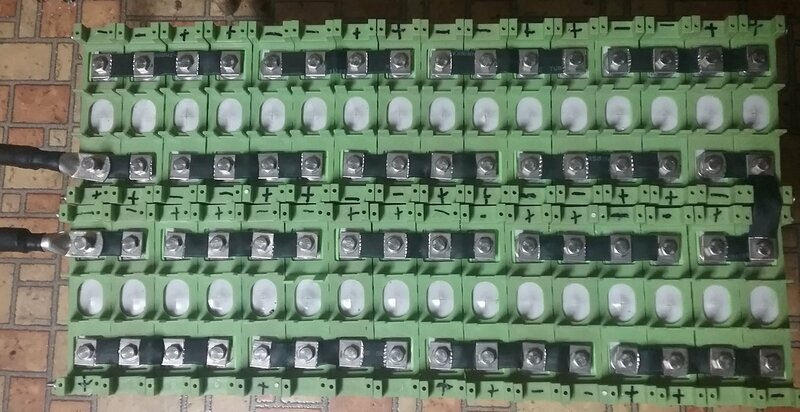 From the picture the way you have wired up your battery will result in the back bank of 16 cells doing more work than the front bank of 16 cells and you will need two separate BMSs. There is some good information on how to wire batteries in parallel here. I use method 2. I can't see any solar panel disconnect relay in the Midnite, am I missing something?. Does anyone know if they are using buck mode or transformer isolated topology? Wow! Brilliant. I can see why you would go for method 2. Since my 32 batteries are really "2" batteries, it seems quite easy to adjust one of the two #00 cables to reform the wiring config to method 2. I have to tell you, I have never liked the way I wired those cells. I don't know why, but the config just didn't feel right. I could have cropped out the array when posting the photo for Rick, bit I chose to leave it in, half expecting someone to comment. Thank you very much for the trouble. btw - one thing I've been unsure of is that I used smaller gauge cabling (4AWG) to parallel in the second 48v bank. When you look up the required wire size on a chart it tells you that 4AWG is good for that length of run. But again, didn't feel right. Now after reading that document from Smart Guage I'm thinking best to use the larger gauge. It's not "required" but I'm assuming the lower resistance of the 00 may have that leverage factor the author described. What do you think? karrak said:I can't see any solar panel disconnect relay in the Midnite, am I missing something?. Does anyone know if they are using buck mode or transformer isolated topology? Not sure about the latter question. There is a relay in there somewhere. You can hear it click on when the circuit breaker for PV input is closed. 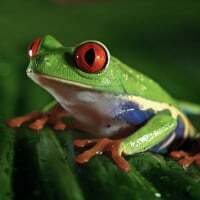 ps - Simon, I am recalling your name from another popular solar forum from months ago, when I was trying to figure out a charging strategy for LiFePO4 cells. I spent hours combing the historical posts. I found your conversations with other members (one in particular) to be quite enlightening. So yeah, those old posts help the noobs. Cheers. A dremel is a quick easy way to make small cuts in metal. Just in case you need a source for buss bars for the above configuration, this is a link to an uncut 20 hole buss bar set for these cells, just 6 bucks each. Aha. A 'parallel as you go' approach. So you are not having to parallel to 16s strings together with cables. Thus only one set of cables required... battery to inverter/cc. Thank you so much for the diagram Simon. I played with a similar config when first planning the array. Could not quite get it though. This config makes total sense and is quite simple. A sign of a proper design. Thanx Rick. Those are the guys I bought my batteries from and they included a lot of bus bars. So I think I'm set. I have to pull the array apart to add cell balancers and some cellLog 8m's. So all can be done at once. Simon, now that this thread has mostly run its course here are the balancers I'm using. Also from Electric Car Parts Company. My only knowledge of a BMS was what I read up on. I was turned on to these by the owner of ECPC, who had gone to China and ferreted them out. They don't use a central control board, nor do they talk to the charge controller... but they daisy chain together and talk to each other. This supposedly makes it easier to achieve and maintain identical voltages for all cells. I'm going to try these out for a while to see how fast they work near top and bottom of charge curve to save cells from going to far up or down. I'm going in with a hypothesis that if they work well, it may negate the need to choose between either bottom or top balancing..
We will see. Have you played around with these babies? A caution about BMS and balance boards. The balance boards can only bypass a couple amps or so. If you are charging with 20A, and the board bypass 3A, you STILL have 17A charging the Full Cell. Hopefully things won't go too off track now you have mentioned the dreaded BMS. I know how those balancers work. The only issue I have with them is that I don't think they should be trying to balance with the SOC between 10%-90% because the charge/discharge curve for LFP batteries is so flat in this range. The only thing you need to worry about with balancing during normal day to day use is to make sure that any of the individual cell's voltages don't go any higher than the set charge voltage say 3.45V plus a error margin of say 0.030V (3.48V) or lower than 3.45V minus 0.020V(3.43V). Once an LFP battery is well balanced it will only go out of balance very slowly over a period of months. You can use the balancing boards to do the initial balance but have be careful to avoid the situation that Mike has described. This is not difficult to do if you slowly ramp the charging voltage up and give the balancing boards time to do the balancing. Then I would set the Midnite bulk and float voltage to 52.8V (3.3V/cell) and let it charge the battery. When the charge voltage has reached 52.8V and the current has tapered off to C/20 (7.2A) and the Cellog8s show all the cells voltages are within 0.050V of each bump the charge voltage up by 0.2V. Repeat the procedure until you get to a charge voltage of 57.6V (3.6V/cell). Have you purchased the Celllog 8s yet? They've been ordered. Due in in a few days.